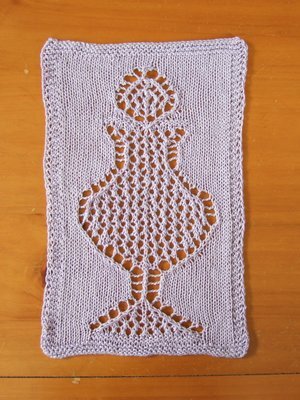 I've started playing around with Highland Silk, it is such a soft yarn, I think I can roll around it that stuff. lol. I'm wishing I could turn my 180 balls of Baby Cashmere & Baby Silk balls into Highland Silk balls ... but I don't think I can pull that off with any amount of prestidigitation. Oh well. This picture shows a much brighter red than it actually is. It's actually a darker red than the skin of a Red Delicious apple. How wide do you think a scarf should be for a guy? 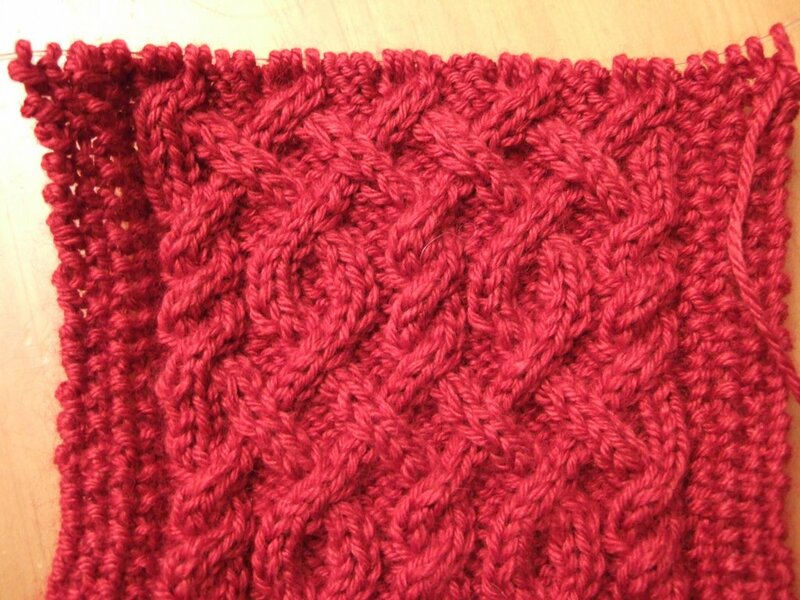 I was playing around with this pattern (which you see in the picture above) and think the cable pattern doesn't look too "girly", but wonder whether the red color and the width, which is just over 6 inches wide, will make it a "girly" scarf. What do you think? Does it need to be wider? 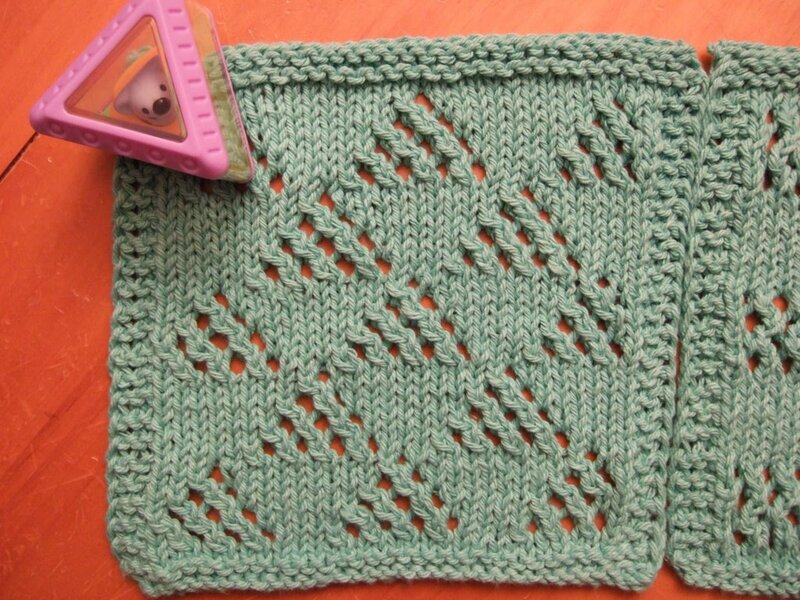 I need to figure this out, because I don't want to dig myself into a deeper hole if this turns out to be too narrow and too "girly" of a scarf for a guy. If it's not "manly" enough, I need to frog it and start over again before I spend too much time doing all those cables. I've probably already done 100 cables on the scarf already! 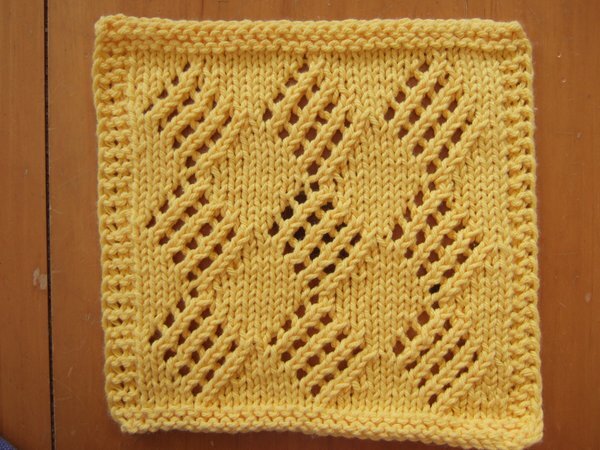 Do you think this scarf pattern is appropriate for a guy? 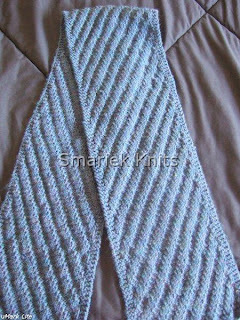 Do you think the scarf is "manly" enough for a guy to wear, especially given its width & color? Will a guy wear this? 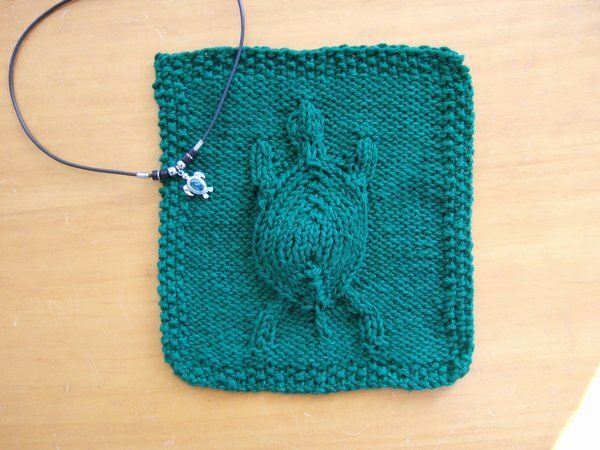 If the scarf needs to be wider, I can frog what I have now and cast on more stitches to add some width. 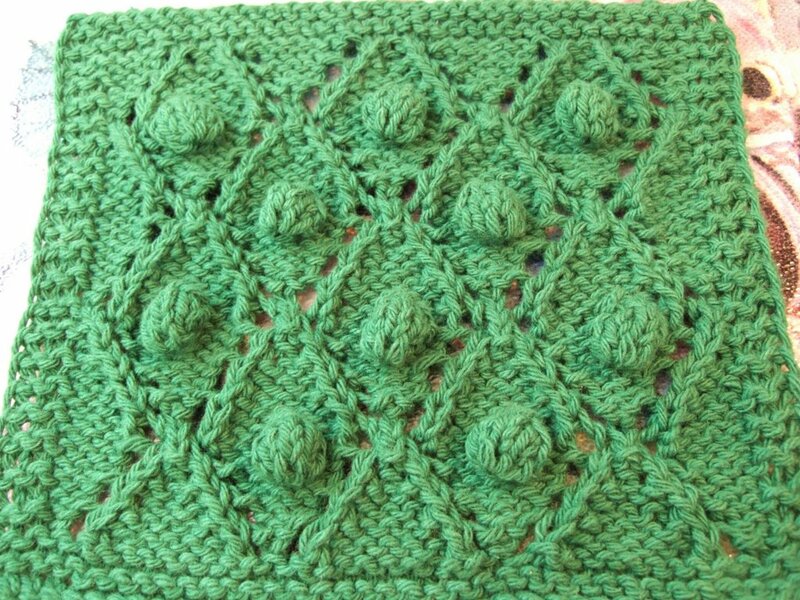 But then my concern would be how long I can make the scarf using only 5 balls of Highland Silk. I've never used Highland Silk before so don't really know what kind of mileage I should expect. 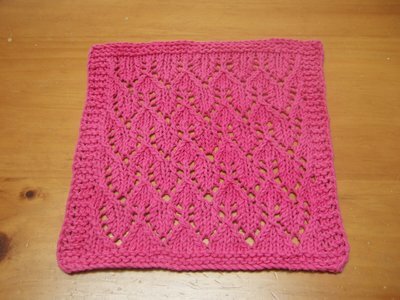 The nature of cable patterns tend to make the scarf contract some, so I lose some mileage there. 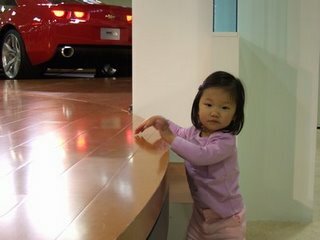 DH took the day off today, so we went to the San Francisco International Auto Show at Moscone Center. We timed it so that we would leave the house at M's naptime, so she would fall asleep on the way. We parked at the garage at 4th & Mission streets, and just waited for her to wake up about an hour afterwards. 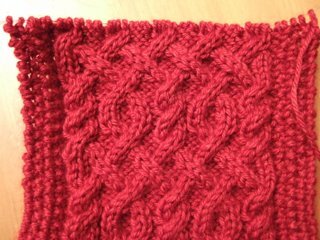 I worked on the red cable scarf while we were in the garage, and boy was it a challenge to work on those cables in dark. The garage has dim lighting. It's too bad we couldn't find a parking space closer to the outer perimeter to benefit from a little sunlight. 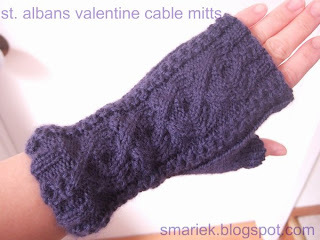 I really can't complain about the cables, after all, I'm not even using a cable needle. Too much trouble. 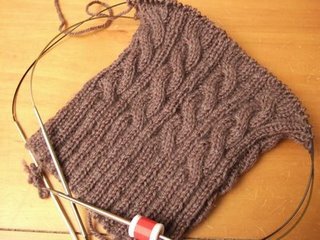 Cables still slow me down, even without using a cable needle. I do have to say that the Highland Silk is a bit splitty. While at the car show, I got to sit in a Porsche Cayman, it's such a pretty car. There was a 911 Turbo on a revolving pedestal, couldn't get inside it, but that's a sweet car as well. Didn't see the Targa. Teatime in a little while... Since we were out and about, I did not make or have any tea at home. I will have some Bigelow Mint Medley tea in a little while, after dinner. This is usually my before bedtime tea, because it is caffeine free. I mentioned stamping in yesterday's post, and said I would take a picture of the things we made when I could get to them (couldn't get to them at the time because M was napping in the same room where they were sitting). 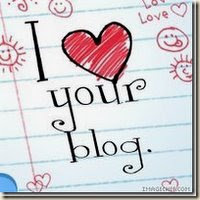 Well, I don't have to anymore, cuz V took pictures and put them on her blog. That works out perfectly cuz she is a much better photographer. Click on the picture to see a larger image. The little gift card on the lower right is cute; the 6-sided (kinda house shaped) "Make Merry" piece actually slips out of its pocket! The purple on on the lower left is a gift card holder. The blue one is a "latch" card design, you pull the grey flap out to open the card. It's not obvious in the photo, but on the green card on the left, the red "celebrate" flap opens downwards. The box was fun to make, but also a challenge. But you can do so much with those! You can also decorate the inside, stamp words on the inside bottom too, add ribbon or something else to the top. When I went over to V's place, I had brought over 15 little jars of stage 3 baby food, which I had leftover after M transitioned into solid food. Can you guess for who? For her babies! Well, they're 3 babies of the feline persuasion. :-) Have you ever heard of such a thing? Cats who like to eat baby food? I couldn't believe it when she told me about that. I don't think the converse would apply, I just don't see M wanting to eat cat food. She is such a picky eater these days. Teatime ... today I am drinking Pink Grapefruit Green Tea from The Republic of Tea. 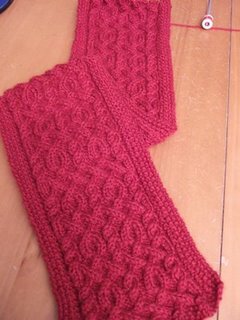 I'm thinking of starting a cable scarf in red Highland Silk (which is shown above). I've got some ideas to try out. 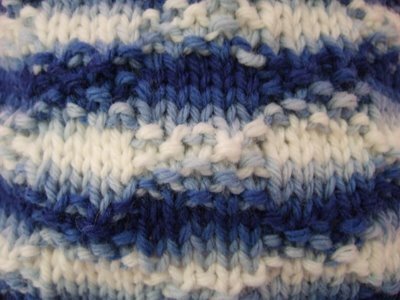 I've never knitted with this yarn before so I will have to play around with it to see how many stitches I would need to make get the right width. I guess I would also need to play around with needle sizes too. 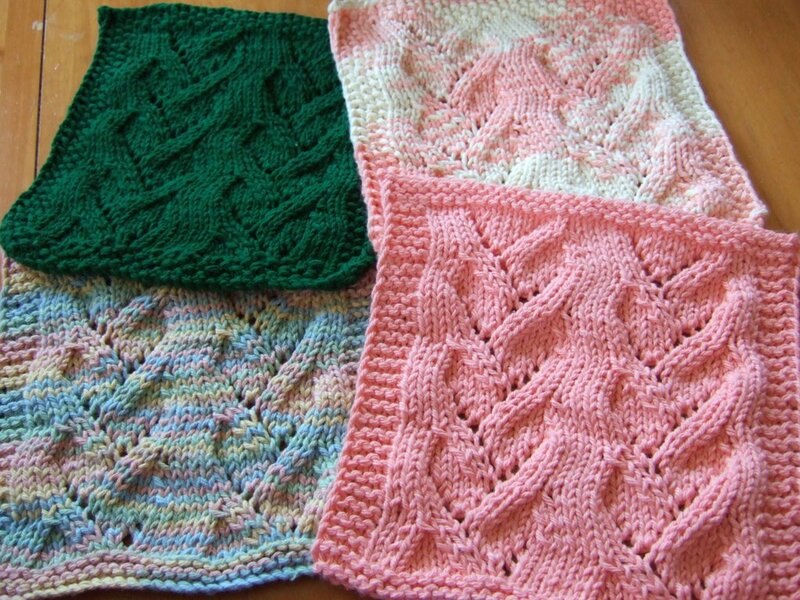 Good thing it probably won't need US7 or US8 needles cuz mine are all accounted for on WIPs or UFOs. I'm going to start with US6, and maybe try US5. On Saturday, I spent the afternoon at V's place where she gave a stamping class. We made four projects, a box and some cards. It was pretty fun. You might consider attending one of V's stamping classes if you live in the San Francisco Bay Area The box was really cool, but requires a bit of math to make. It's a good thing V was there to make it a whole lot easier, especially with marking the paper scorer so we didn't have to figure out where to score the paper. I'll have to add a photo later, can't go take a picture right now since M is napping in the same room where my completed projects are. 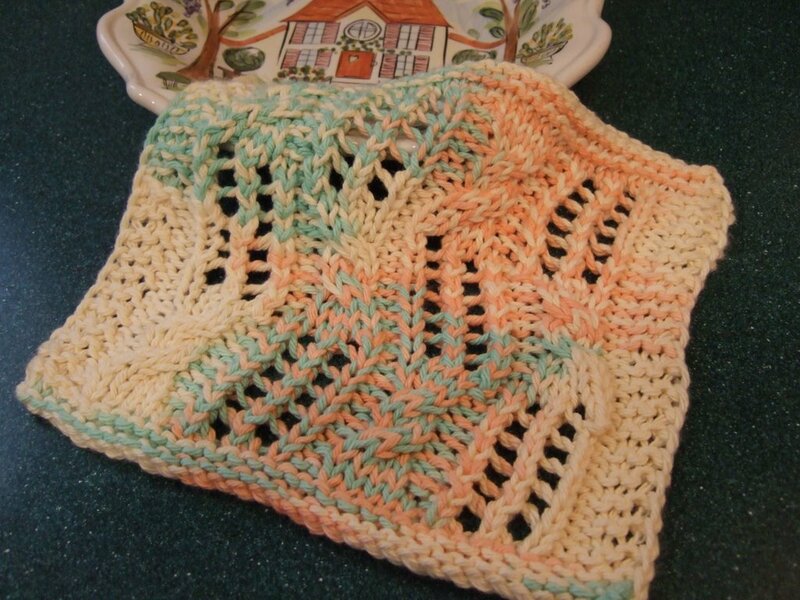 Afterwards, T taught me how to crochet. We made a chain and did single crochet. 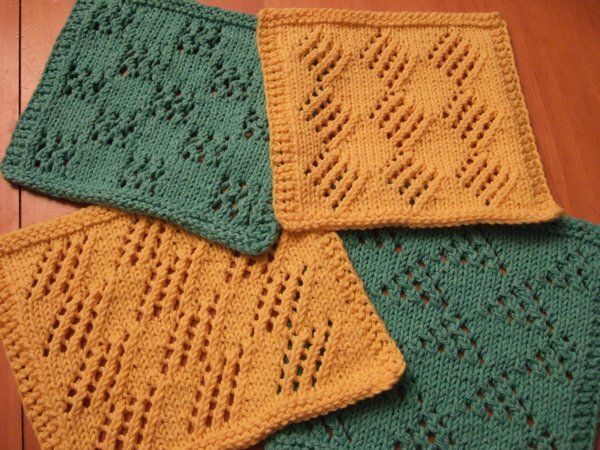 It looks so easy, and there is only one stitch to keep track of really, unlike knitting where you have a higher probability of losing many stitches. 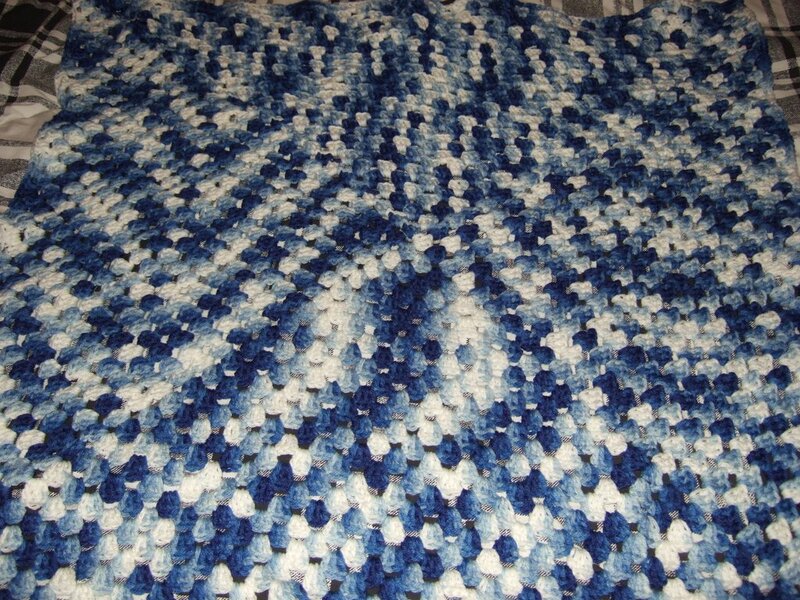 And you definitely get more mileage out of crocheting, so I see how it goes much faster than knitting. 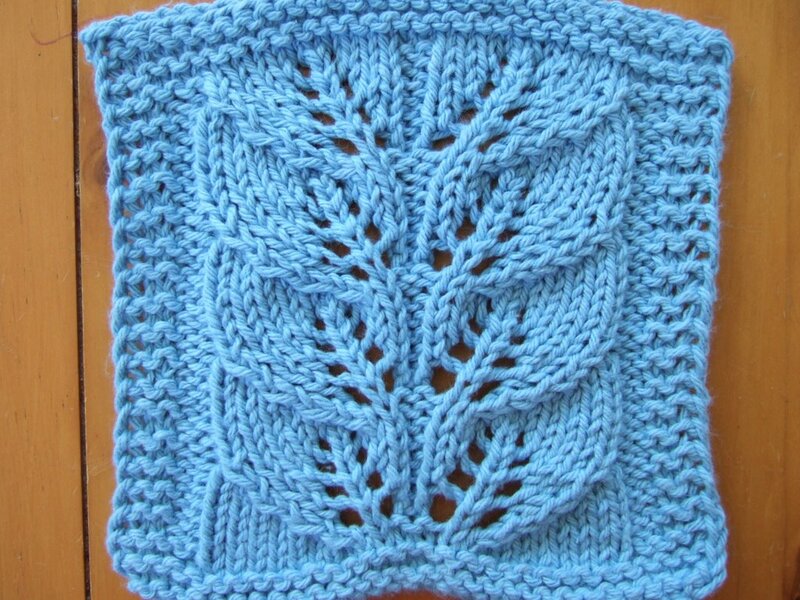 I will have to practice crocheting a bit and then try making a hat. 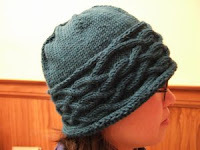 Perhaps I'll get more "hat" shaped hats with crocheting than I do with knitting. T is a very talented woman, she makes her own beads and jewelry! 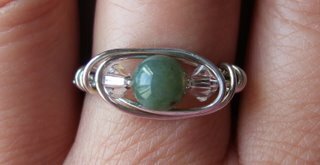 You can see one of her bead stitch markers in this post here. The picture doesn't really do it justice, the stitch marker is absolutely gorgeous when you see it in person. Here's a picture of one of the rings she made. 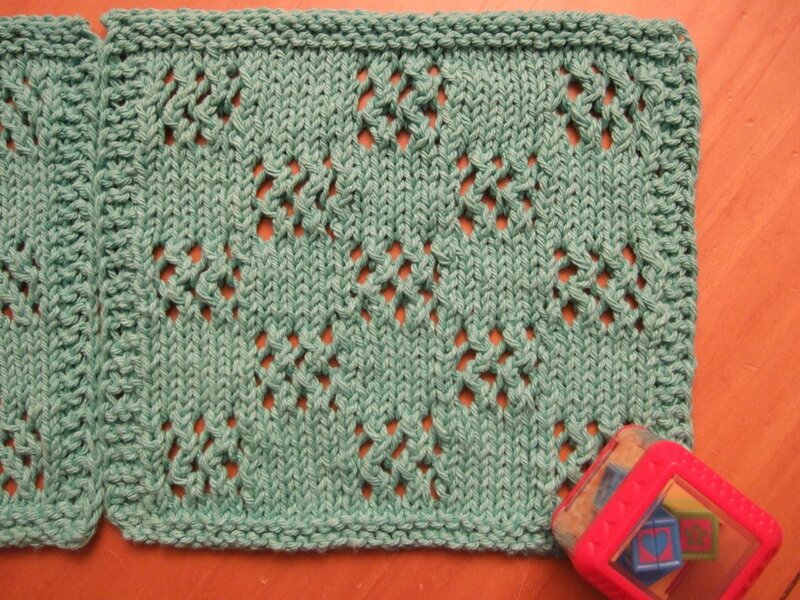 Not making much progress in knitting. 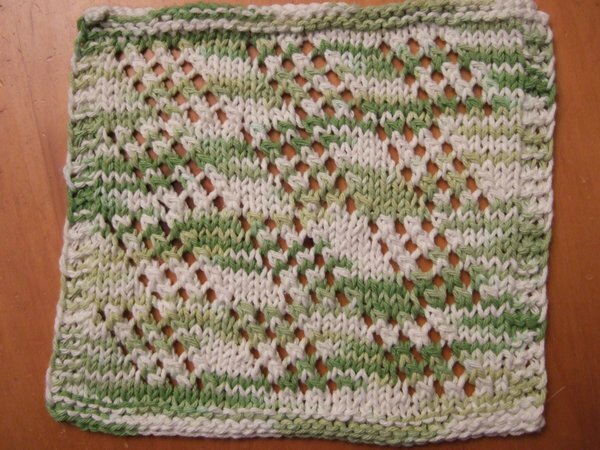 I'm still working on a Garterlac dishcloth, it's been in the works for over a month now. 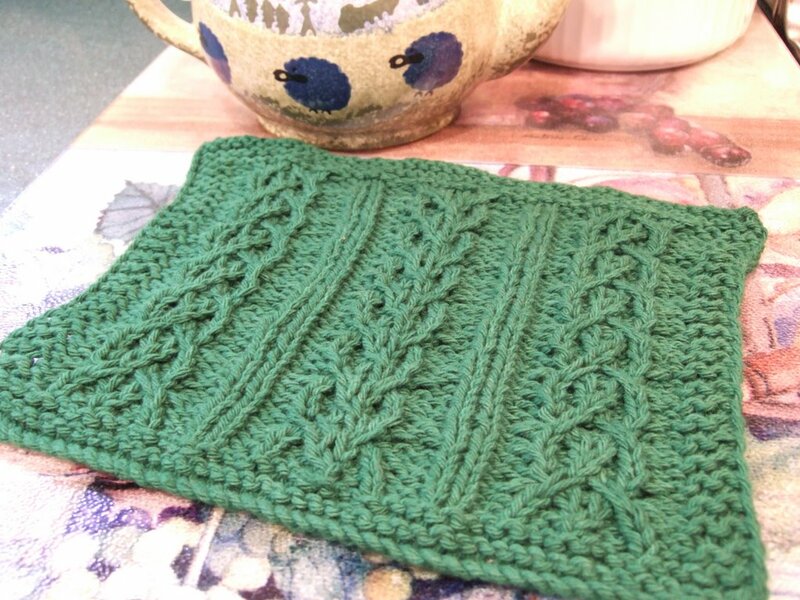 I've made this cloth before and it wasn't that difficult to do, however I find it challenging to concentrate on it with all the short rows & turning involved. 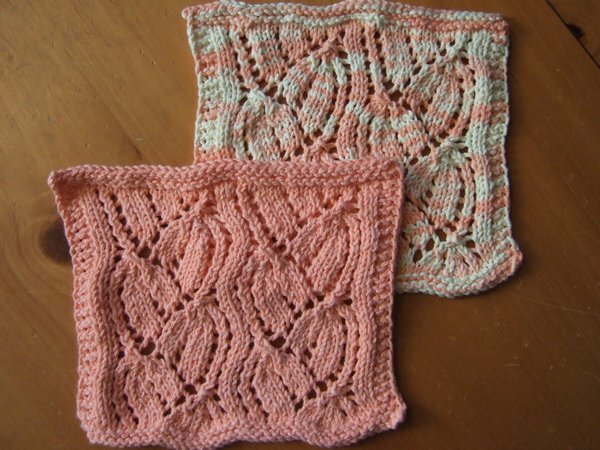 It's much faster to knit lace and cables, than to knit anything with short rows. I don't think I would ever manage to finish any entrelac style scarves or stoles (like the Lady Eleanor Stole). Teatime ... I made a pot of Lupicia 5224 Lichee tea today. I always associate lichee black tea with the computer game The Sims because I used to drink a lot of lichee tea when I used to play the game, this was years ago, definitely before baby. 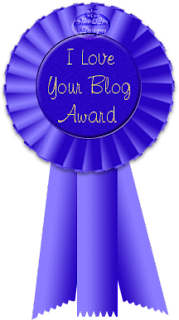 I also associate Bath & Body Works White Tea & Ginger lotion with The Sims because I used that a lot back then too. That's the funny thing about scents & flavors..
Lookie what I got ... another little white box with just a few balls of Highland Silk yarn. 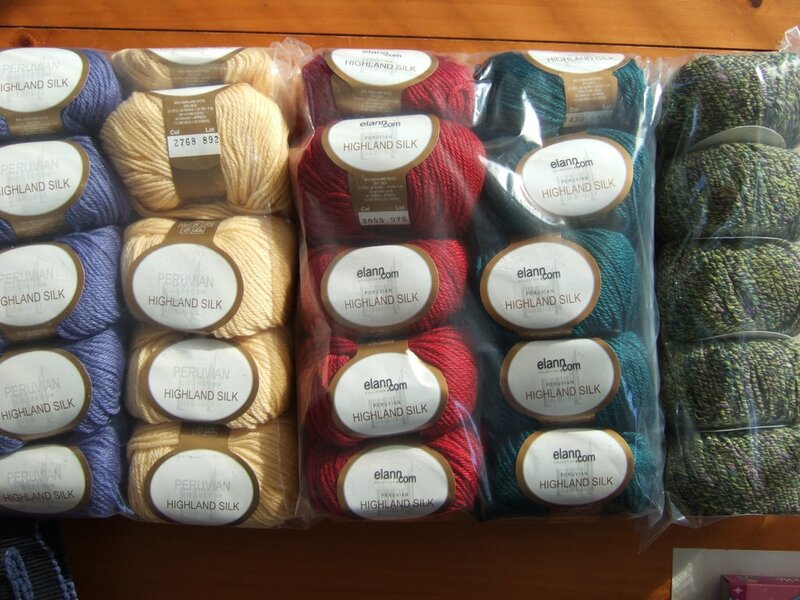 The green one on the right side is the Super Tweed. 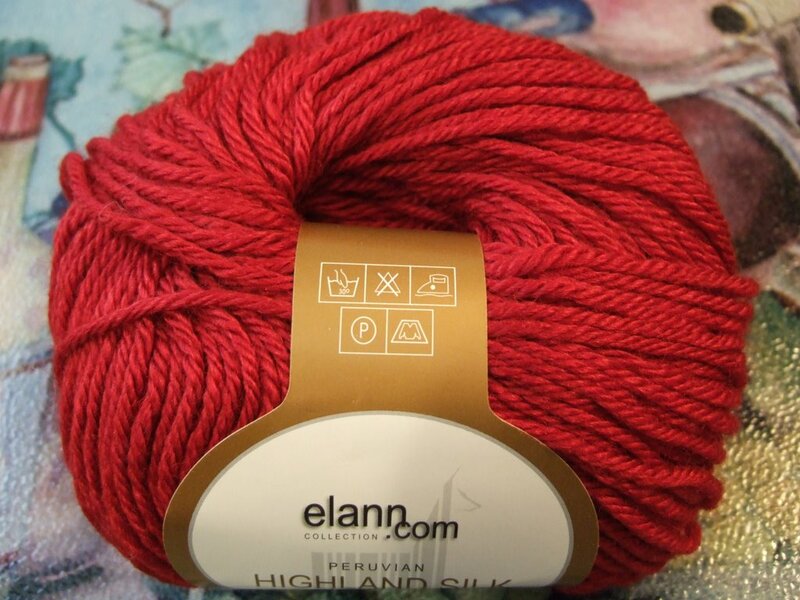 The Highland Silk yarn is so nice, I'm thinking I need to trade in my Baby Silk and Baby Cashmere for Highland Silk instead. 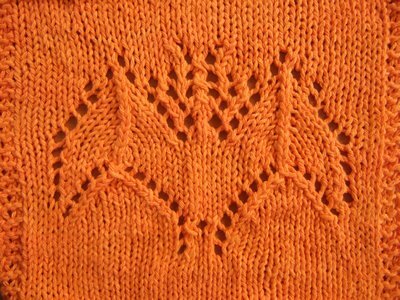 I guess I feel this way because I can see myself finishing something using Highland Silk. 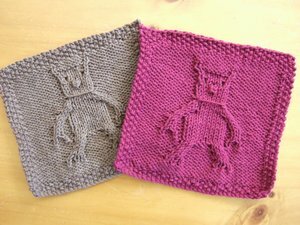 I just don't see myself getting much done with fingerling weight yarn at the rate I'm knitting these days. 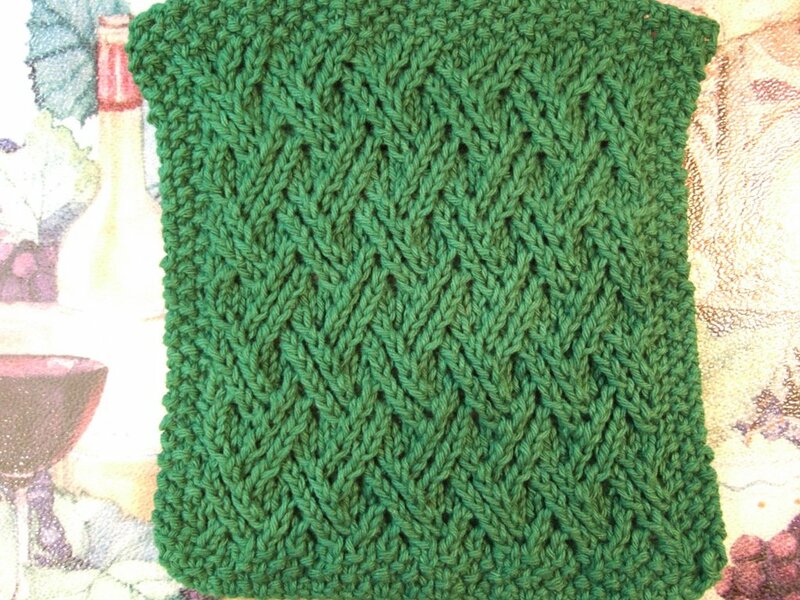 The red or green will become a cable scarf for T, and I need to make my mom something. 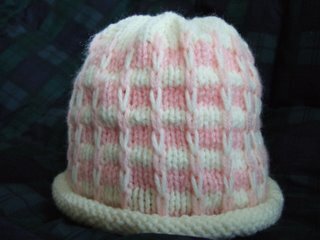 Trying to figure out how to finish off the pink & white hat I'm working on. I wasn't sure I would have enough pink yarn for the stripes at the top of the body, but I managed it. 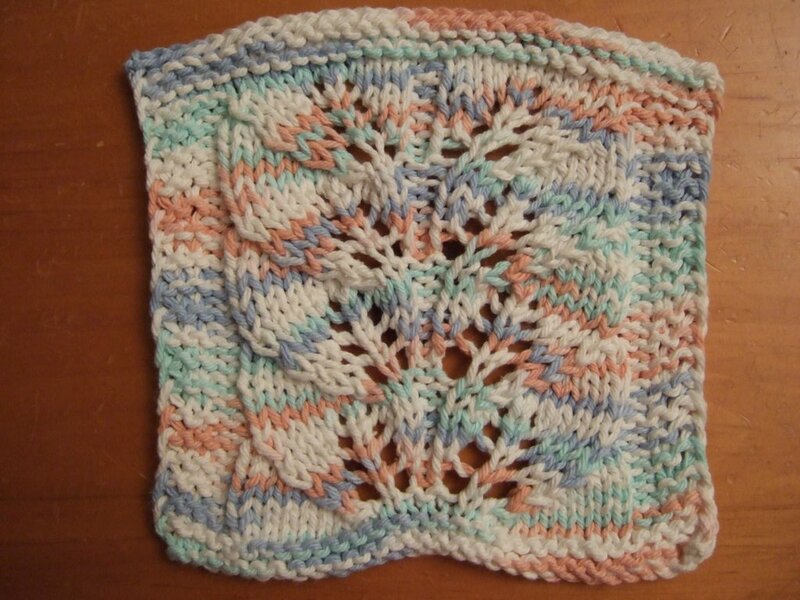 Now I'm thinking, could I manage to do a pink & white striped decrease at the top? Or not risk running out of yarn and do it all in white. 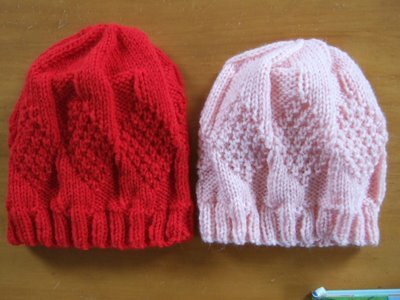 I can't believe I have made little progress in the hat dept during the past few days. 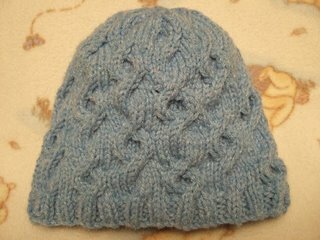 I frogged the blue hat I started last Thursday because I cast on the wrong number of stitches and didn't discover it until after knitting 8 rounds. 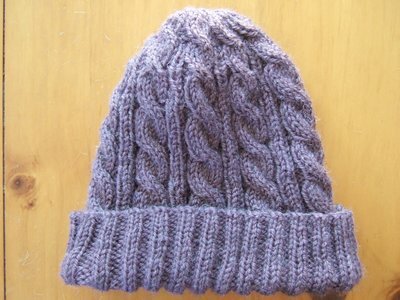 I started a purple hat on Friday and cast on the wrong number of stitches, so I had to start that one over. 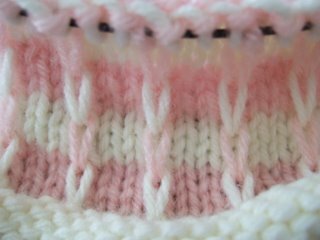 Haven't made much progress on that one, I've knit about an inch of ribbing... it takes a lot longer to finish a round using DK weight yarn compared to WW weight yarn! 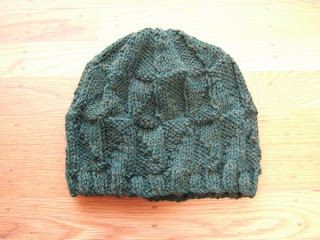 Then I decided to give 2-color knitting a try, since I needed to do something with the odds & ends I had that weren't enough to make solid colored hats. 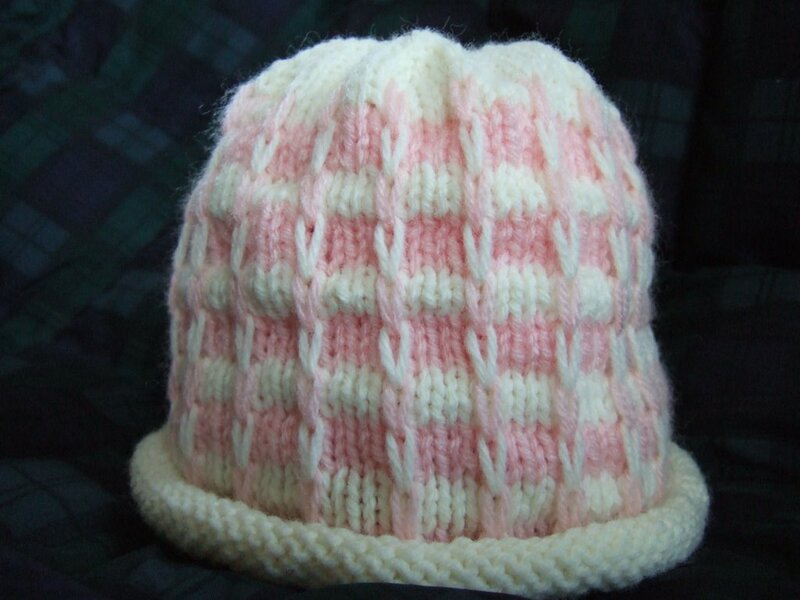 I sat down with my Peaches & Creme yarn label and translated the "ballband" cloth pattern for kniting in the round, then started my ballband hat in pink and white yarn. I got about halfway up the boby of the hat and then decided that the hat was way too large. 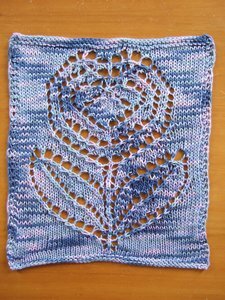 I didn't notice that before because I was too caught up with knitting the pattern. 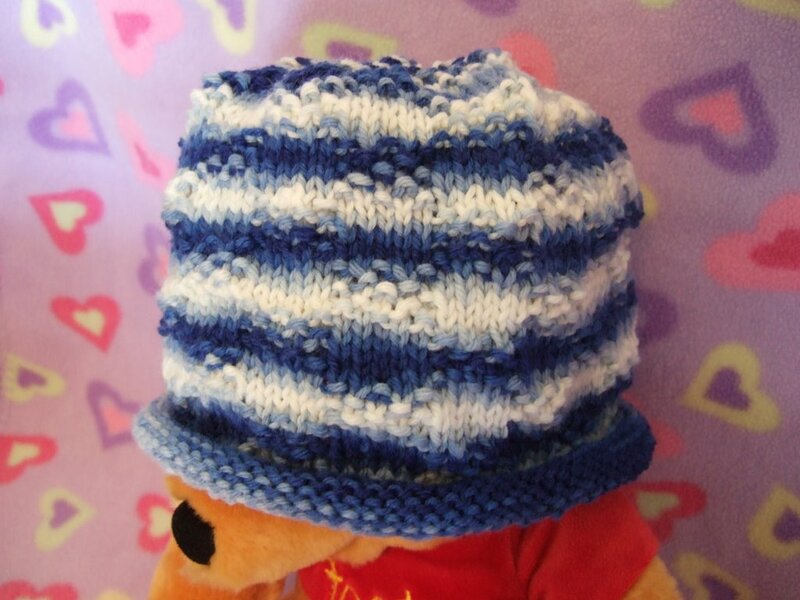 So I frogged the hat and started over with a different pattern. 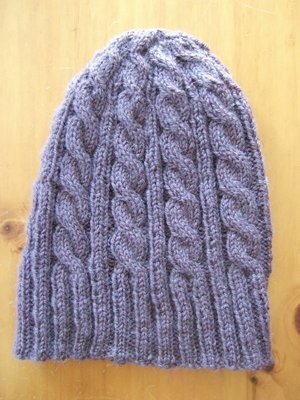 Yes, I could have started the ballband hat pattern again, but I got bored with it and wanted to do something else instead. You can see the latest incarnation above. I've already had to correct a booboo in this hat where I had to frog 4 rows. I'm normally a tinker, but this time, I actually removed the needles and pulled the yarn until I got to the row I needed to go back to, then picked up stitches with my knitting needles. It always makes me nervous doing this. 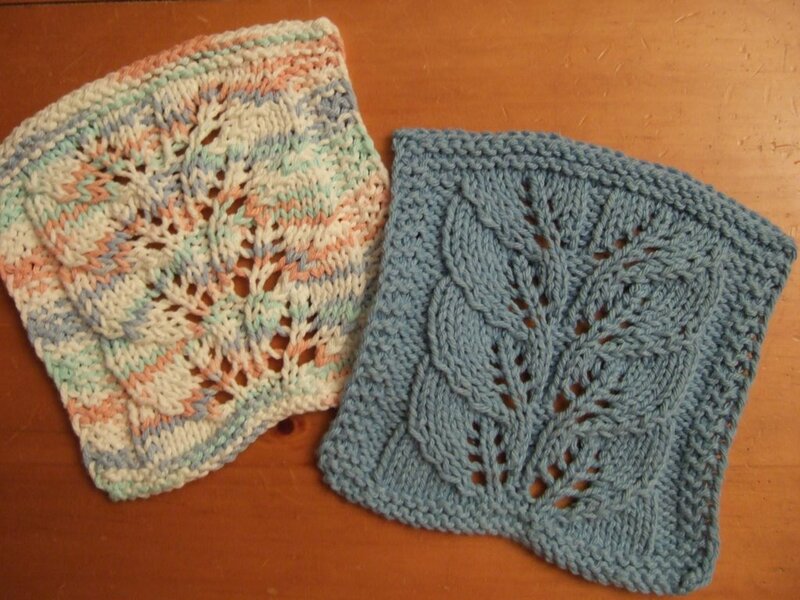 Other WIPs include 2 dishcloths, one which I started a few weeks ago, and the other I started 2 days ago. 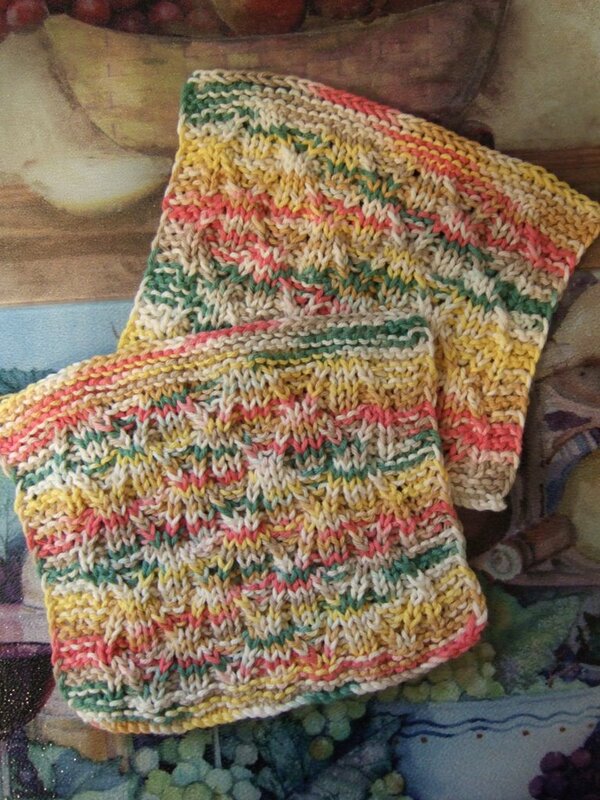 I know, it doesn't make much sense to start a second dishcloth when I haven't finished the first. And I still have a scarf in progress. I spent a bit of time rewinding yarn into balls. I really don't like those burrito shaped skeins with the center pull skein. 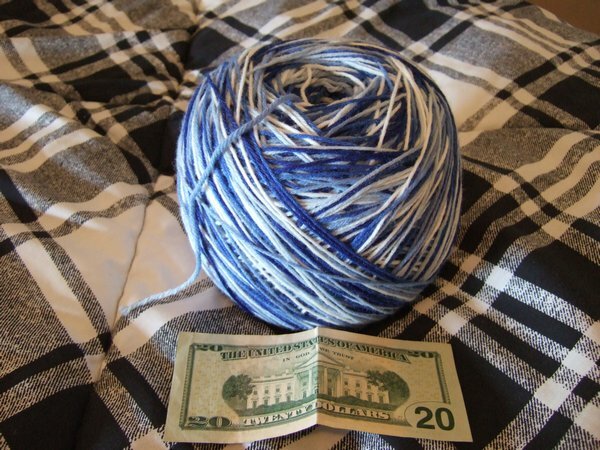 If I work from the pull skein, the yarn collapses on itself near the end and sometimes ends up in a big tangled mes. I also don't like working them from the outside because they "roll" funny. What I need to get a better feel for is how much yarn I need to finish a hat. I've got balls of different sizes from the odds & ends. Maybe I need to get one of those little kitchen scales so I can see how many ounces a ball of yarn contains. 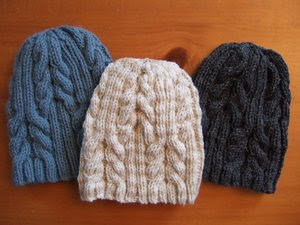 I think I can make a hat out of 3.5 ounces of yarn, definitely 4 ounces. I'm thinking that I should be OK if I combine two balls which are the size of a 10 ounce jar of Classico Sun Dried Tomato Pesto. Teatime ... I made another pot of tea today, Lupicia's Ming Jian Jin Xuan Oolong tea. I love the flavor of Oolong teas. Since it is cold over here, I've been giving M some tea as well. I pour a bit in her sippy cup and then add some room temp water so she won't find it too hot. She loves tea, perhaps because it is something different from her usual milk or water. Sigh... what to do, what to do... Do I frog the whole thing and cast on again with 96 stitches? 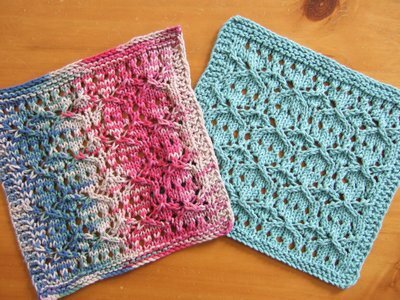 Or do I find make something else using 90 stitches? I decided not to frog ... 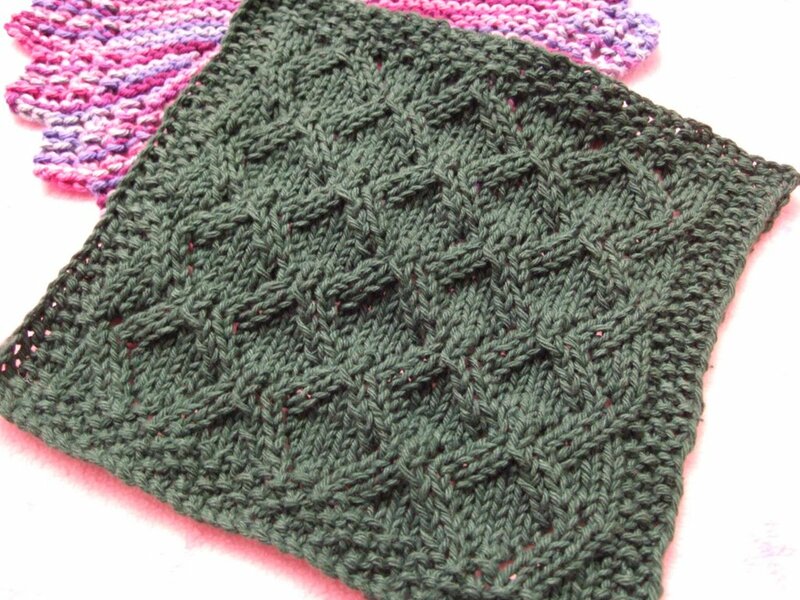 I know, it was only 8 rows of stockinette, but the whole process of casting on, counting, dividing stitches, counting, then joining the round is just so tedious. So I'm working a different design for this hat. 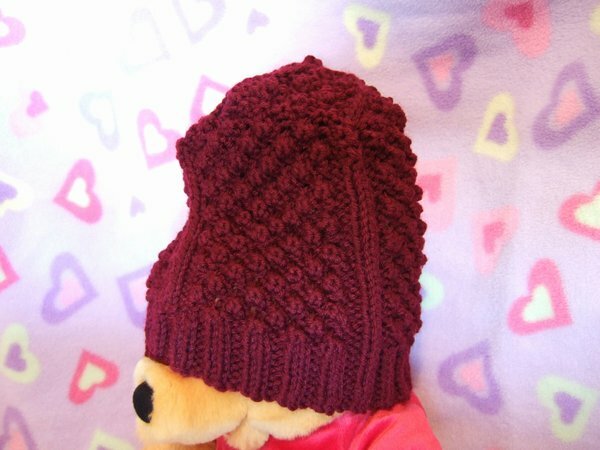 Not sure what I'll call it, maybe "The Accidental Hat", lol. 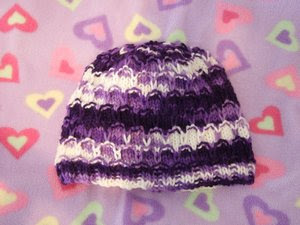 This will be my second hat worked on that big ball of yarn I got from frogging a crochet lapghan I found. Teatime... I made another pot of tea today. Jasmine Pearls from Imperial Tea Court. M knows I drink tea. She will point to my cup and say, "tay." I need to find a way to get rid of the dark tea stains on my teapot (and mug, for that matter). 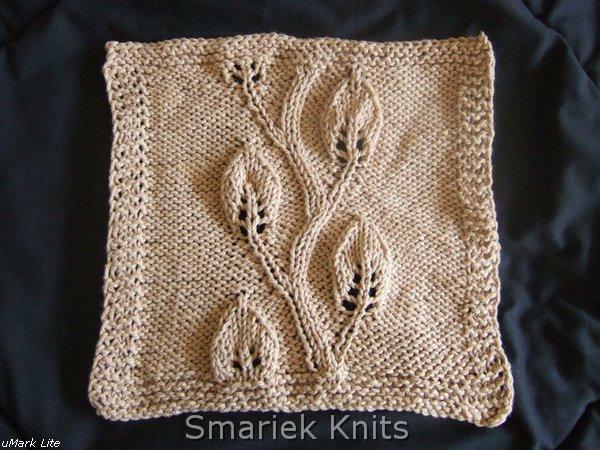 This cloth is similar to the Travelling Vine Scarf I made a while back. 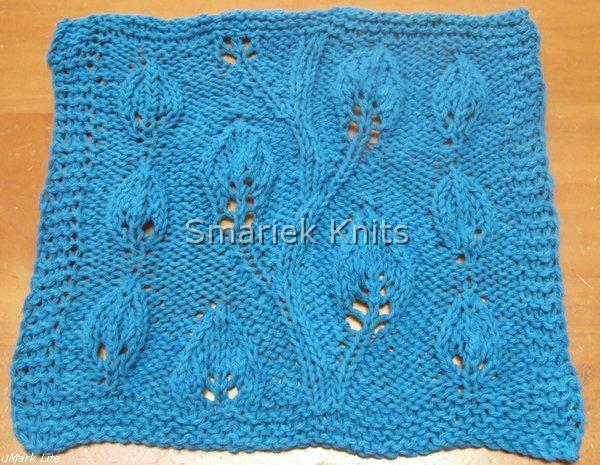 The pattern really shows best after blocking. 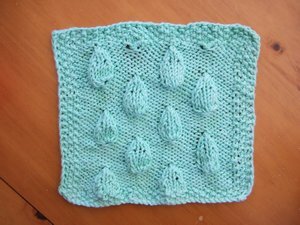 Not sure you can see the vine pattern in this picture, with the green baby blanket in the background ... look at the holes and you'll see the vine pattern travelling upwards. I'm surprised I even got such a focused picture. I put the cloth in my little girl's crib thinking it would enable me to take a picture of it without her grabbing it (which she does when I place my knitting on the coffee table), but she was fussing & leaning on me while I was trying to take photos so the camera was not very steady at all. Using Worsted Weight cotton yarn and US7 (4.5mm) needles, cast on 34 stitches. Repeat rows 1 to 12 two more times. Instructions in parentheses followed by x2 or x3 means you do what is in the paretheses the number of times indicated after "x". For example, (yo, K1-b, yo, ssk, K5)x3 means you do the following: yo, K1-b, yo, ssk, K5, yo, K1-b, yo, ssk, K5, yo, K1-b, yo, ssk, K5. Eight woolly sheep on my lawn all a'grazing. and I asked "Hey Nick, did you knit all this stuff?" And I laughed to myself for I'd thought up a plan. 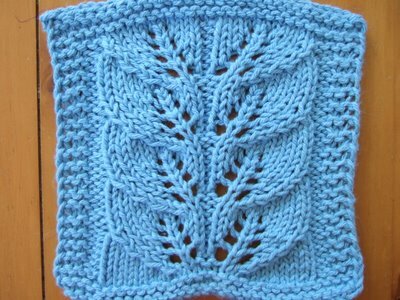 "Next year start your knitting sometime around June. 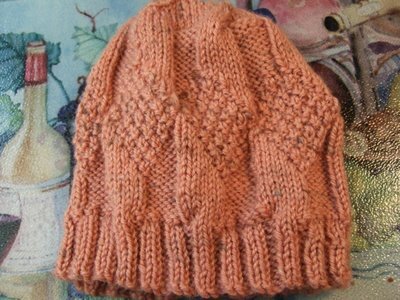 Let's see.... my other project is another "mindless knitting" hat which I am about halfway done with. 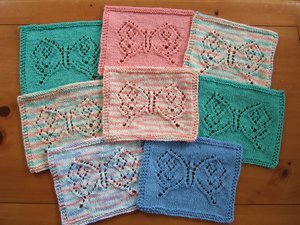 Why does it seem so much easier to work on charity knitting than knitting for family & friends? Or even myself? 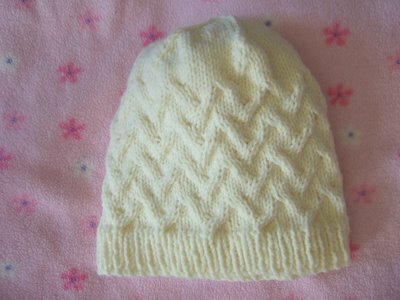 Gosh, I can't remember the last time I knitted something for myself. 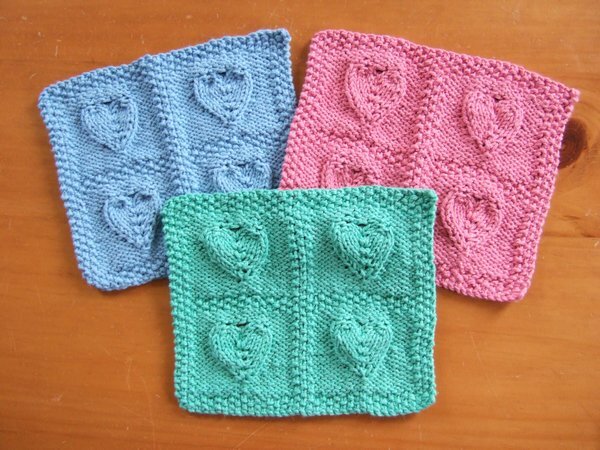 When was the last time you knitted something for yourself? 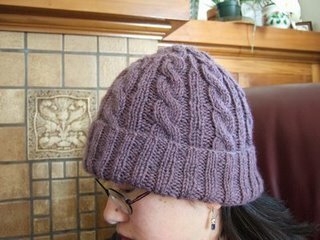 Someone left a comment on my 3AM Cable Hat post inquiring about whether this hat was "worked on straight needles, DPN's or circular needles" and I thought I'd answer the question here. 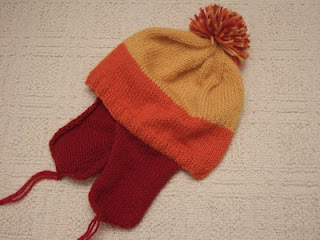 Plus I've answered this question many times in email, well not this specific question, but questions about whether my other hats are knitted in the round or flat, how did I do it, etc. All my hats, except for the Claudia Hat, are knitted in the round using the 2 circular needle technique. 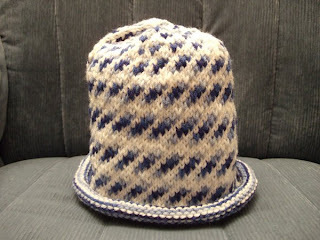 You can find step-by-step instructions here: http://www.az.com/~andrade/knit/twocirculars.html. 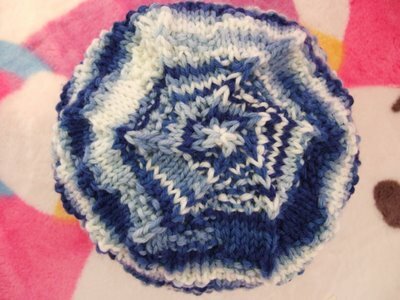 I used to be intimidated by patterns which were knitted in the round until someone pointed out this technique. I gave it a try, and now I can't go back to flat knitting of round objects. 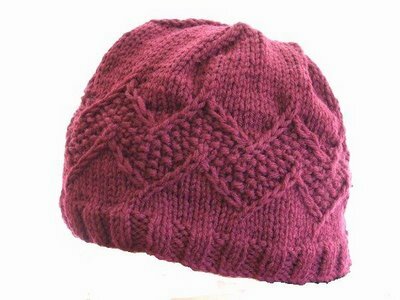 The only reason the Claudia Hat is knitted flat is because I'm not savvy enough to figure out how to do it in the round; this hat is knitted flat and then seamed in the end (a major PITA!). I finally finished my first I-Cord, and am making another one. 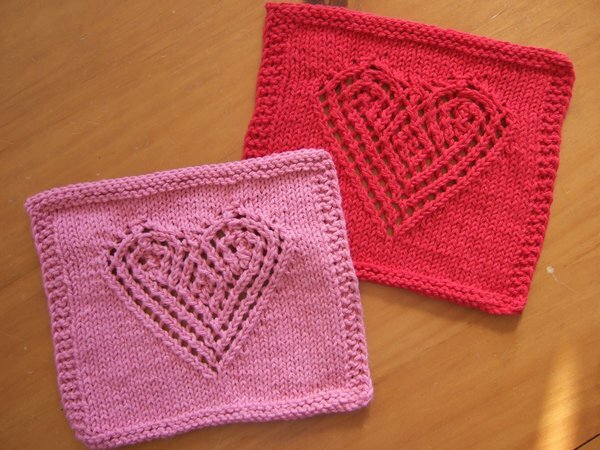 They're both for my mom. I've found I-Cords to be the perfect car project when DH is driving. I used to think that I could knit while he's driving, but he tends to get drowsy while driving so I have to talk to him to keep him awake ... which mean I can't do any knitting that requires concentration or counting. Grrr. So working on I-Cords is perfect, don't need too much brain power to work on those. 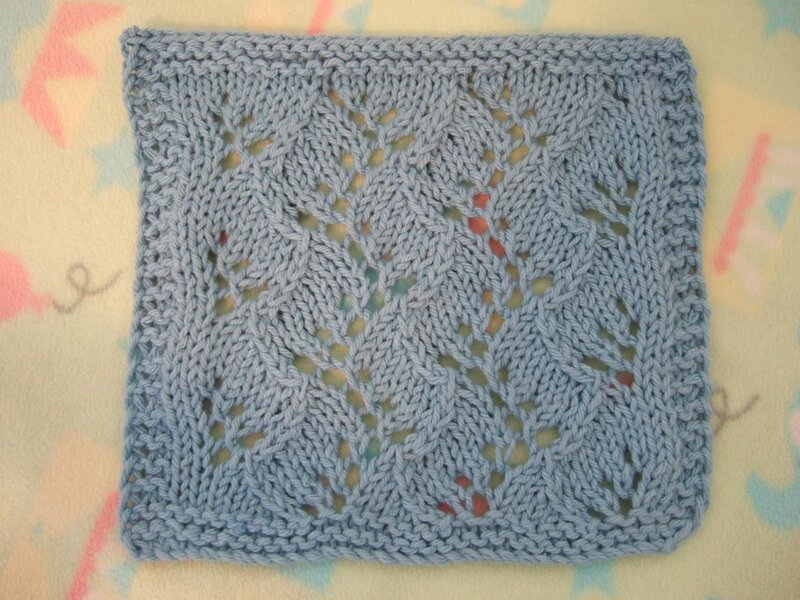 It's how I finished my first I-Cord, I worked on it in the car while we drove back from the inlaws last night. Yes, it was kinda dark in the car (it's that change to Standard Time) ... another reason why I-Cords are great for mindless knitting. Don't plan on doing much knitting today. I really need to do something I've been procrastinating on ... reading that voter pamphlet I received aeons ago. Tomorrow is election day, it looks like it won't be rainy (yay! ), so M & I should be able to get to the polling place without too much trouble. My voting booklet says that there is a 0.4% slope to the polling place. I think they're smoking crack cuz it is more like a 40% slope uphill. And boy is it gonna be a doozy of a walk compared to last year, with M just over 20 lbs now. I'll wear her in the Ergo Baby Carrier. I can really feel the weight difference. Today I am drinking Everyday Jasmine tea from one of my favorite tea vendor, Imperial Tea Court. I made a pot of it, because DH took today off. I usually do pots of tea on the weekends when I feel I can sit down & relax with my cup of tea (but in reality, I'm still running around doing chores around the house). On weekdays, I tend to do tea bags for their convenience. 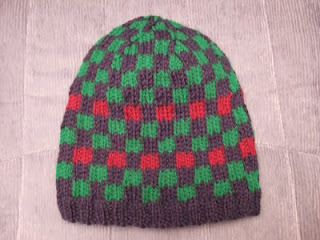 Here's my 7th hat for the Cap Karma Chemo Cap Project. Woohoo! 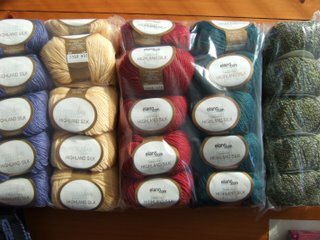 Was going into storage boxes and I found a box of yarn from aeons ago. 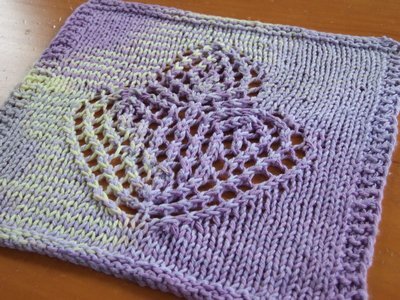 Nothing fancy, mostly worsted weight Red Heart yarn. 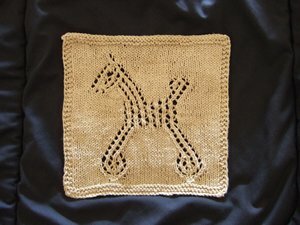 I guess I did play with yarn as a kid, I just don't remember it all that well... but then, it was a LONG time ago. 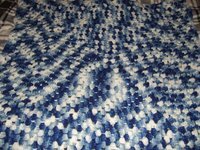 I must have learned how to crochet at some point in time because there is a 40 inch x 40 inch (102 cm x 120 cm) granny square lapghan of some sort! I don't even remember working on that. 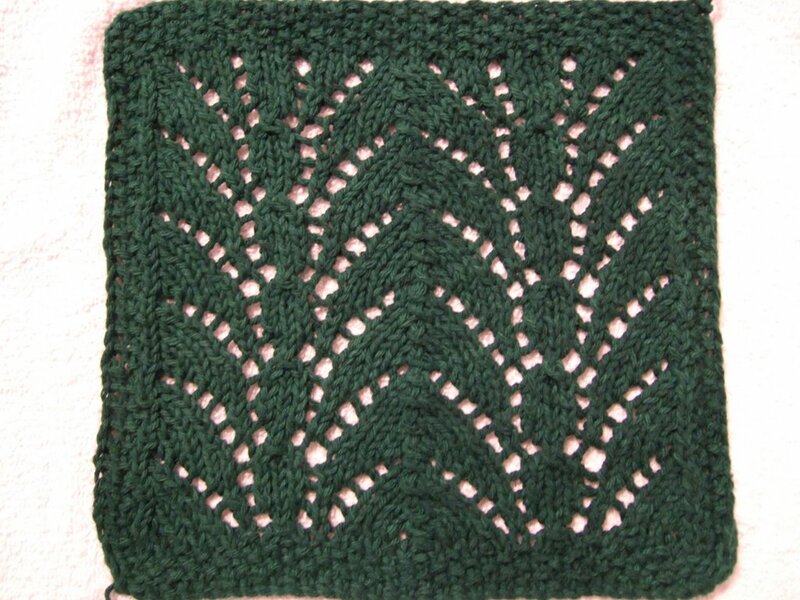 Wish I remembered how I did this thing, I can't recall any crochet stitches. Boy is my memory wonky!